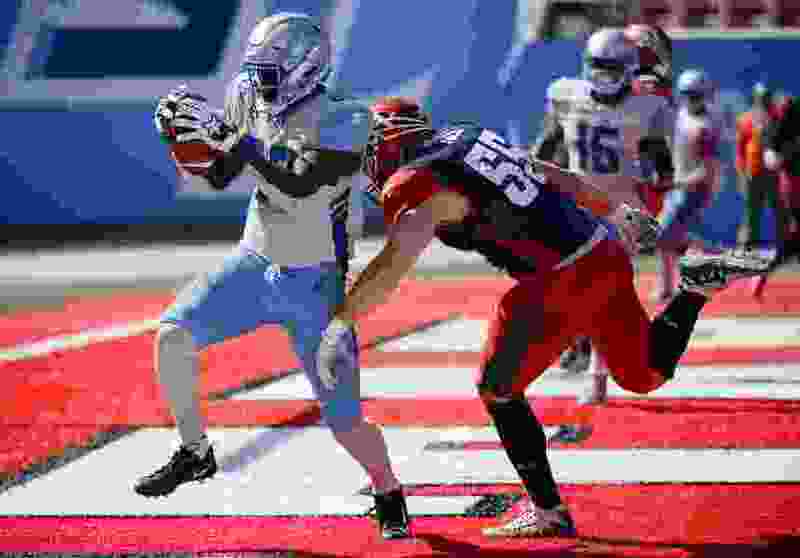 (Francisco Kjolseth | The Salt Lake Tribune) Anthony Denham #88 of the Salt Lake Stallions scores a touchdown ahead of Davis Tull #55 of the Memphis Express as the Stallions host the Memphis Express of the Alliance of American Football in Salt Lake City on Saturday March 16, 2019. Fresh off a big home win over Memphis last weekend, the Salt Lake Stallions take to the road again Saturday to face the Western Conference-leading San Antonio Commanders (4-2) in the Alamo city. After fits and starts, Salt Lake (2-4) finally played something resembling a complete game in last week’s 22-9 win over the Express at Rice-Eccles Stadium. On offense, Stallions quarterback Josh Woodrum threw a pair of touchdown passes to tight ends Nick Truesdell and Anthony Denham. Woodrum has now racked up 623 passing yards in his last two games. The Stallions also did a decent job of taking care of the football. Turnovers plagued them during the early part of the season. Defensively, Karter Schult continues to make a name for himself. Schult was named the AAF’s defensive player of the week after a dominating performance against Memphis, leading the charge for a defense that recorded seven sacks against the Express. He has a league-leading seven sacks himself this season, along with 18 QB hits and 21 solo tackles. The Stallions return home next week, playing host to the San Diego Fleet on March 30 at 6 p.m.